Full Planning Permission for 183 Houses. In sought after established residential suburb with excellent local amenities and facilities. Strong and significant local employment base. 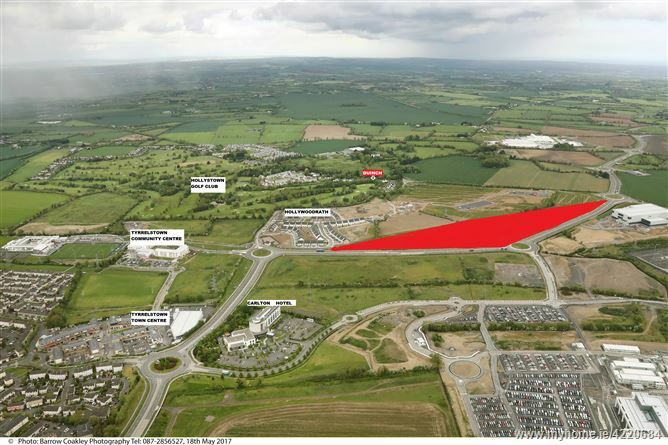 Situated 12 km north west from Dublin city centre and 4 km from Blanchardstown. Immediately adjacent to the M2 / M3 Link Road providing ease of access onto all the major arterial routes. Beside an excellent range of retail commercial educational community recreational and leisure facilities including Tyrrelstown Town Centre. Blanchardstown Town Centre. Educate Together Primary School Le Cheile Secondary School. St Brigids Primary School Kilbride. Mount Sackville Girls School,Castleknock College and Blanchardstown IT. Hollystown Golf Course. The National Aquatic Centre and Sports Campus. Phoenix Park. Dublin Zoo. The Victorian Peoples Flower Gardens and Ashtown Demesne. The subject Lands are zoned Objective 'RA' under the Fingal County 2017 - 2023 Development Plan. Zoning objective seeks to "Provide for new residential communities in accordance with approved local area plans and subject to the provision of the necessary social and physical infrastructure"
68 x 3 Bed. Semi-detached and Terrace 111.6 sq. m.
26 x 3 Bed. End Terrace 111.6 sq. m.
13 x 3 Bed. Semi-detached / End Terrace 114.6 sq. m.
31 x 2 Bed. Mid/End Terrace 89.8 sq. m.
3 x 4 Bed. Semi-detached 133.0 sq. m.
6 x 3 Bed. Semi-detached 109.4 sq. m.
5 x 4 Bed. Semi-detached / End Terrace 150.6 sq. m.
12 x 3 Bed. Semi-detached 113.6 sq. m.
1 x 4 Bed. Semi-detached 153.8 sq. m.